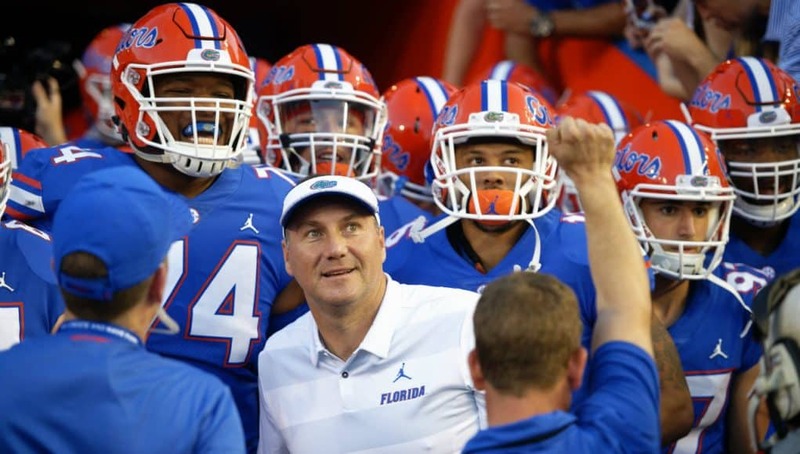 GatorCountry brings you a new podcast as we recap the Florida Gators win over Charleston Southern on Saturday night to open the 2018 season. Andrew Spivey and Nick de la Torre break down how the offense looked and what they liked about Feleipe Franks’ night against Charleston Southern. Andrew and Nick also talk about the defense and which guys stood out to them on the defensive side of the ball, plus what they thought about the special teams play. Andrew: What’s up, Gator Country? Your man, Andrew Spivey, here with Nicholas de la Torre. Nicholas, Game 1 in the books, and it is what it is. It was expected. The Gators put up 50. I told you, Mullen. I told you about them expectations. The Gators did what they were supposed to do, and I think there was a lot of good moments in the game. I think there were a few moments that stood that need to be improved, but overall it was a good debut for Dan Mullen. Nick: Yeah. 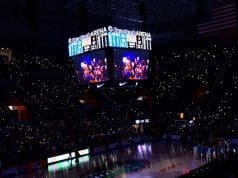 FSU fans were paying as close attention on social media to the Gator games as Gator fans were, and they made a good point. I think you do need to temper some expectations, because of who the opponent was, but I think Dan Thompson, our boy DK, said it well. I put it into my story, stolen from Dan. Florida won a game against an opponent in the manner in which they were supposed to win it. It wasn’t sweating it out versus UAB, sweating it out versus Louisiana-Lafayette. This game was pretty much over whenever the contract was signed. That’s how it should be. We talked about it all the time when we talked about Will Grier, and he played some terrible talent in high school, but he dominated. When Florida plays teams like Charleston Southern, that’s the kind of performance you need. You need to give up 3 passing yards. You need to put up 400 yards of offense and 50 points and get turnovers and block punts. Florida did, to me, what they needed. Listen go ahead and be excited about the game. Other than getting to Atlanta to be Alabama’s sacrifice to the football gods in the SEC Championship game, there hasn’t been much to cheer about. I’m totally fine with fans enjoying and reveling in this win. Just know that that’s the worst team that Florida will play this year. Andrew: Again, I’m with you. You have to temper expectations. Again, I said this on Friday, and I said there was nothing in this game that Franks or anyone could show me that would say Franks is going to be an All-SEC quarterback. There was nothing in this game that showed me that Todd Grantham’s defense is going to be the best defense in the country or anything like that. Simply because of who it was. You have to show this on a consistent basis and show this against inferior talent. You have to show this against Kentucky, and then move that into Colorado State, which is terrible. They might be as bad as Charleston Southern. Then you move that into Tennessee and down the road. I think the biggest thing for me was not only did you do what you were expected to do, but the energy level, Nick. A lot of times in the past seven years Florida would play down to teams they were supposed to beat. They would come out looking like a team that were going through the motions. This was a team that came out looking like they were coming out to play a cupcake game, and they were all trying to pad their stats. Nick, we all played NCAA. If we played NCAA against Charleston Southern, we were trying to get our quarterback to throw 700 yards and boost him up on the Heisman. That’s what these guys looked like they were going out there to do. CJ Henderson, on the field goal block, looked like a man trying to get his first ever block. Awesome. Zack Carter made the block. To me, Nick, that stands out as the moment that said, this is a different football team. When Zack Carter blocks the field goal to keep a shutout alive, and the team celebrated like they won the National Championship, I was like Mullen’s message has gotten across. Special teams is big. Jeremiah Moon blocks the PAT later, and they scoop and score. Damien Pierce makes an unbelievable play, just looked like he had gotten shot out of a rocket, comes down there and makes a bulldozing tackle on kickoff, and they celebrate that stuff. For me, those are the small things that you see as winners in this game, more than the 53 points. More than the three passing yards allowed, or the six points allowed. It’s the little things that show this team is different. Nick: The mindset, the approach, the excitement. They were having fun again. I think that I saw some improvement from Feleipe Franks, in terms of pocket awareness, in terms of going through reads. I think the play that set up the 30-yard pass to Lucas Krull, the play that set up the jump pass. He had a skinny. He had a post, the same post, that he could have tried to squeeze it in to Tyrie Cleveland, and probably last year he does. He does try to squeeze that in. Instead, looks off, checks down, and there’s a wide open Lucas Krull. It wasn’t a perfect pass to him, but when you’re that wide open, you just get the guy the ball. Nick: He got him the ball, and it goes for 30, instead of maybe an incomplete pass or maybe even something that gets tipped and intercepted by trying to squeeze in for a bigger play to Tyrie Cleveland. Andrew: Yeah. I said it in my recap of my thoughts on the game. That play sticks out as well. There was two passes, Nick, that stuck out to me that showed a little bit different player to me, as far as confidence goes. One was the slant for the first touchdown pass to Van Jefferson. That was a ball last year was probably thrown 300 miles an hour and at his ankles, but it was a good slant pass. The second one was the back-shoulder fade to Van Jefferson. It was incomplete, but it was a ball that was perfect. Van was going to catch it, or nobody was going to catch it. Those are the two passes, for me, that stood out as different. Then also the pass to Kemore Gamble. Kemore was the third read on that, and he was still wide open in the middle of the field. Feleipe went through read one, wasn’t there. Read two wasn’t there. So, he goes to read three, and it’s there. Kemore gets, I want to say, a 16-yard catch on the play. Could be wrong on the total there, but it was over the middle on just a little sit-down route for Kemore. Those were the things, and Feleipe stepping up in the pocket and having better feet. Those were the things that I think showed the most. Someone pointed out to me this morning, we’re taping this on Sunday, that a lot of that could be that he has time when he gets to the line of scrimmage. He’s not rushing once he gets to the line of scrimmage. He’s getting to the line of scrimmage, and he’s having 15-20 seconds to look over the defense, make checks, that kind of stuff. Maybe the game’s slowed down for him because of that. I didn’t think about that last night, while watching it on Saturday night, but now that I think about it from that perspective, maybe that was a key. Nick: There was one play, I think on the first couple drives, I think he started 1 for 5 the first couple drives. Andrew: Which, to be fair, a couple of those should have been caught. The ball over the middle to Van should have been caught. The ball to C’yontai should have been caught. Nick: Absolutely. He keeps dropping passes. Andrew: He’s going to find himself sitting beside you and I before long. Nick: It won’t be long until he drops another pass. I forget who the pass went to, but Jordan Scarlett picked up a blitz coming off the strong side. Picked off a blitz, and Franks didn’t freak out. Just calmly stepped up, moved up in the pocket, and delivered a strike. There was a pass that, I think, that might have been the pass that RJ Raymond dropped. Andrew: I believe it was. Yeah. Nick: Yeah. I saw a more confident, listen, he’s never been not confident vocally, but when I say more confident I’m talking about in terms of him playing. Played confident last night, so that was good to see. Kentucky struggled with Central Michigan yesterday, so you’re not playing a good team yet. It’s certainly going to be a more competitive game, so I want to see the stuff, the good things I’m saying about Feleipe Franks, I want to see that again. I want to see that and continue to build upon that. Don’t just be happy that you had a good game and you threw five touchdown passes and take a week off. Keep improving on that, because it was good, but there’s always room for improvement. Andrew: Again, this is what I’m going to say. Someone is going to come at me and say I’m being a Debbie Downer or hater or whatever, but, again, like I said on Friday and I said in the opening, nothing in that game shows that it’s going to be a year-long thing. Nothing. He’s got to continue to show that to go on and improve things. But like we both said, he showed different things that are making us both believe that he has improved in that. My next point, Nick, is the offensive line. I saw some good things, and I saw some same old, same old things from this offensive line. Still a non-aggressive offensive line, and I don’t know what else it’s going to take for that to happen. It’s just guys were in the right spots just getting beat. I’m not sure what it’s going to take for these guys. When you’re getting out physicaled by Charleston Southern’s 225-pound, 230-pound defensive ends, that’s not good. I believe it was Martez who was ran over by one of their cornerbacks. It just cannot happen. Nick: Yeah. I thought the pass blocking, for the most part, was good, but really no push in the running game, especially early. Andrew: Here’s my thing, and that is I think that when you get back to having Brett Heggie in the line it makes it better. I wouldn’t be surprised to see that happen soon. Again, I think the offensive line improved as far as knowing what to do, but didn’t improve on being aggressive enough to be physical. Nick: I feel like they’re tentative to get to their spots. Andrew: Yeah. It’s almost like a thinking process for those guys. Am I right? It doesn’t matter if you’re right, at the end of the time, because when the play’s happening you don’t have time to think about the play in your head. Just go knock the son of a gun out that’s in front of you. Andrew: That’s the way I look at it. Nick: I agree with you. Listen, man, the average weight across the line was 249 pounds. That should have been a game for the offensive line to be throwing guys around like ragdolls, and you didn’t see it. They had two jokers starting that were 220 pounds as defensive linemen. Freshman David Reese is 220 pounds. Andrew: Right. Exactly. That’s something that has got to improve. Again, Nick, we’ll go back and say this again. That is something we expect to improve as the year goes on, just simply because of the guys learning as it goes on, as the guys are learning what Hevesy is teaching, that kind of stuff. I do think that gets better. Just, I really did, I expected this team to come out and just dominate on the line against Charleston Southern, simply because of what Mullen has been teaching the guys and that kind of stuff and wanting those guys to be aggressive. Nick: I don’t think John Hevesy will be overly thrilled when we speak to him on Monday about the offensive line play. Andrew: Exactly. Again, that’s kind of where I’m at with the offensive line. Nick, I guess, do you think they shake it up and move Heggie in? Nick: Yeah. I mean, Brett Heggie played yesterday, but not much. If you’re worried about a foot or anything with him, you don’t need him. You don’t need him to play a ton. Nick: I would expect Heggie to be a starter when they play, when they play Kentucky. Andrew: Okay. Let’s move on to the running back position. Nick, I mean, I don’t want to say I was surprised, because I wasn’t, but at the same time I was surprised. Good grief. This running back group is ridiculous. When you look back, and you think about what Scarlett can bring to the table, what Perine can bring to the table, we knew what those guys were going to bring to the table. I did think that Malik at times came out and didn’t look maybe himself at the game. At the early part of the game, I thought he was a little tentative, but I think as the game went on he started to trust his knee a little bit more, and as he trusted his knee a little bit more you started to see the Malik Davis we all thought he could be. Holy cow. I knew Damien Pierce was good, but I didn’t realize Damien Pierce was as shifty as Damien Pierce was. Again, Charleston Southern, but Damien Pierce is going to be a freak to watch out for. Nick: He runs with bad intentions, low center of gravity, and I think he’s going to be a player. I wanted to talk about, and I get it. Someone on Twitter was talking to us about you and I and Lamical Perine. Everyone forgets about the other guys. Yes. I think Damien Pierce is going to be a great player, but it’s like just because he’s a freshman they want to see him. Everyone wanted Emory Jones to start before, before Feleipe Franks looked the way he did. It’s just because he’s a freshman. I get that we love recruiting, but Damien Pierce is not better than Jordan Scarlett. I don’t think he’s better than Lamical Perine. He’s 18 years old. These guys are 21, 22 years old. They’ve been through it before. I think Damien Pierce is going to be a great player, but I don’t think he’s better than the guys in front of him. There’s a reason the other guys are in front of him. Andrew: Right. I’m with you. Nick: I wasn’t saying it to you. That’s just me reacting to fans. It’s not just at the running back position. It’s kind of all over the place. I get that you want to see the new guys, but the old guys were the new guys at some point, and you wanted them to play when they were freshmen too. I don’t think you’re going to be a very good team if you start the 18 players that were in the class last year. Andrew: Right. Exactly. Again, I don’t think that you’ll see him start, by any means, or anything like that. For me, the thing that I was impressed with was him on special teams. He did well on special teams, and he earned that. Again, Scarlett and Perine did nothing to show me that they haven’t gotten better. I thought both of them did. Lamical ends up with two carries for 28 yards. Scarlett, six for 24. Malik, six for 38, and Damien Pierce, eight at 75. Pierce had a 9.4 rushing average per carry. Malike, 6.3, Lamical, 14, and Jordan Scarlett at 4. So, they all had their moments in the game. Listen, that was a game that everybody was going to play. All freshmen that were healthy played in the game. So, you can’t take a lot from that to say this is what the running back rotation is going to be like. I do think that you will see Scarlett, Perine, and Davis taking 99.9% of the carries for the most part. I will say this, and that is Scarlett and Perine showed their pass pro, and that’s something Dan Mullen talked about wanting to see the team do at running back. That’s exactly what they did. Nick: You’re not going to play, and Mullen, I think, said it after the game, reps are precious. Especially in a room like that, when you’ve got five guys that can all carry the ball, if you’re not picking up blitzes, or you’re messing up the pass pro, I don’t care how good you’re running the ball. Someone else can run the ball just as well, and they’re helping us in another area too. So, that’s going to be important. I think both Perine and Scarlett can catch the ball out of the backfield. I think they do that a little bit better than Malik Davis, and if you’re going to start splitting hairs when it comes to getting reps at that running back position, you’re going to start looking at those things, like you just mentioned. Catching balls and helping in pass pro. Andrew: Exactly. Yeah. Again, like I said, a lot of good things you could see on offense in the game. A lot of things that can improve as well, but it’s Game 1. One thing I want to say before I move to the defensive side of the ball, Nick, and that is I like the coaching moments for these guys on the sideline. 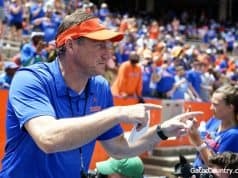 No matter how good or bad the play was, you see Mullen, Hevesy, Billy, the rest of the staff, really talking to those guys on the sidelines after every play. That’s something that you would see with a few coaches last year, but you’re seeing a ton of this year. Mullen and Feleipe were talking almost every play, or almost between every series of the game, and that’s something you want to see. Again, that’s something that is going to help Feleipe continue to grow. Nick: I agree. I agree fully. Overall, I thought the offense was exciting to watch. I thought the offense would give you hope, but I do temper expectations, and I kind of want to see it again. Andrew: Absolutely. I don’t disagree with that at all. I do too. I want to see the jump pass again, Nick. Nick: Jump pass is back. Shuffle pass is back. It’s nice to see those old things from probably the best era of Gator football ever. Nice to see those little familiar things coming back. Andrew: Exactly. Let’s move to defense. Man, I feel like we could spend the rest of the show talking about defense, because there was a lot of good things. First off, Jachai Polite did not start the first series, because he did not live up to Gator standards, whatever that may be, but Jachai Polite is a freak. That’s just all there is to it. Nick: That’s just all there is to it. Andrew: I was trying to think back to the last time I remember seeing a defensive lineman dominate a game like that, and, Nick, I may be wrong, and if I am just tell me, Dominic Easley? Was that the last time you really saw a defensive lineman just dominate a game like Jachai did on Saturday night? Nick: Probably. Probably Easley. Yeah. Andrew: I mean, it’s been a while for me that I remember a defensive lineman dominate a game. I take that back. Donte Fowler in the Birmingham Bowl. Nick: Yeah. That would probably be it. I forgot about the Birmingham Bowl. Other than Adam Lane. Andrew: Other than Adam Lane. You still cleaning his pants for him. Anyway, yeah. Besides that, I would say it’s probably since Donte Fowler. Jachai Polite, there was a play, Nick, and it was a play opposite side to him. It’s to the weak side. It was an option, and I want to say Jabari missed a tackle. Anyway, the quarterback took it for about 12 yards, and Jachai chased him down from the opposite side. Chased him down and made the tackle. Jachai is not a small guy to be chasing the quarterback down, and London Johnson wasn’t a bad quarterback, or wasn’t as slow quarterback. Let me say it that way. Anyway, that was a play that really stood out to me for him. Just a really, really good game for Jachai. I’m going to say this, and that is Cece is taking that suspension, and good luck getting your spot back, buddy. Nick: I think Jachai is a better football player than Cece Jefferson. Nick: I’ll say it. People might not agree with it. You do, but people might not agree with it, but I think he is. Andrew: Four tackles and had a pass breakup and a forced fumble. That was something, Nick, when’s the last time we saw both of your defensive ends, which I guess you could say defensive end and buck, really just when they knew they weren’t going to get to the quarterback just stop, throw both hands up? Nick: Yeah. When was the last time? Nick: I’m trying to think. I got nothing for you. Andrew: It’s been a while. Nick, there was somebody else that stood out to me. Not more than Jachai. Jachai had a great game. But somebody that really caught my attention as just being so comfortable in this defense. Listen, I’m biased towards this person when I say this. Nick, you know who I’m talking about when I say that. Just looked so comfortable and had a good game. Jeremiah Moon at that buck spot. I mean, he almost looked like he was born to be a buck, which that’s perfect for him. He looked really solid at that buck spot and wearing #7, looking cool. Nick: You like those little numbers. Andrew: I’m big on that. I like that. Couldn’t get used to Antonneous Clayton wearing 77 though. Nick: No. I don’t like that. That was his number in high school, and he hated it, but kind of made it his own, so he’s, I guess, going back to that. Not a fan of that one. 7 looks good. You nailed it. I think Jeremiah Moon, that’s a perfect spot for him, and there’s a couple guys on the team, Jachai Polite being another one, that that’s a perfect spot for him. He can line up wide, doesn’t have to put his hand in the dirt. Even when he goes and puts his hand down, that buck spot is perfect for both Polite and Moon. Nick: Adam Schuler came in late, and he got a fumble recovery. That was someone listed at defensive tackle, and we were saying he played end at West Virginia, but you can see, when you’re running that 3-4, it’s more of an end spot for him. Andrew: Right. Don’t forget about Umstead. He had a big pass pressure late in the game, and Zach Carter. Zach Carter is a good football player. Always been a good football player, but showed us what we all thought he could do. Had a couple of pass hurries, and there was one quarterback hit that he hit as he was throwing the ball. I don’t know if the poor guy is able to walk this morning because of it. He leveled him in the ground. It just goes to show you just really how deep this defensive line is. We haven’t even talked about Kyrie Campbell yet. We haven’t even talked about TJ Slaton. We haven’t even talked about Khairi Clark, the rest of the inside guys, which Campbell did play, but we haven’t talked about the rest of those guys up there yet. Haven’t talked about Conliffe yet. Just because of how much depth there is on this team. Nick: Depth, and we really saw it on the defensive line, truly three deep. Nick: Everywhere. Truly three deep everywhere. Andrew: I guess, one person that stood out for you on the defensive line? Nick: Polite. I think TJ Slaton as well. Andrew: Slaton is a monster. Nick: Yeah. Slaton and Conliffe. Conliffe playing that nose tackle. Nose tackle is kind of a thankless job, but I’ve talked about them a lot already as being those guys in the middle. I think it’s going to be good things from them all year long. I liked Trey Dean. Trey Dean is just talking that smack the entire game. Andrew: Listen, it’s different smack than Chauncey Gardner talks, because he’s trash talking and trying to back it up. We won’t go into anything further than that. For me, Trey Dean, he had some good plays. Missed a tackle. It was atrocious. Donovan Stiner played well. John Huggins had his first pick in the secondary. For me, and I told you this in text last night during the game, Nick, when we were talking, I said Huggins is nasty out in space. There is no doubt about it. He can sit out there in space and make some tackles. John Huggins is going to be a good football player. Nick: I didn’t know if he would play much this year, but I thought that he would be a player to come along. For him to get that late interception, I think it was second to last play of the game, I think that was good to see. I think he’s going to be a good player. I’m still not sure it’ll be this year. Like you said, in space making tackles, very impressive. Very impressive, especially for a young player. Andrew: Looked good. Then CJ and Marco didn’t get much action. They tested CJ in the end zone, and that was politely broken up. Let’s move to linebacker, Nick. You and I talked about this. There was a lot of competition there. Two guys that stood out to me. Ventrell Miller stood out to me. He had a monster hit in the game. The guy that stood out to me that I think might be the most improved player on defense, and I’ll give you one guess real quick, Nick. Andrew: Rayshad. Rayshad Jackson I think is a guy who might be the most improved player on the defensive side of the ball at linebacker. Rayshad looked comfortable. Looks like he’s really grown into that spot, and Rayshad’s athletic enough to play in coverage. I might go on record as saying Rayshad Jackson might end up being the best linebacker on the team at season’s end. Nick: I didn’t see it. Nick: I didn’t see it coming in. Andrew: Okay. I thought you meant you didn’t see it in the game. I was going to say. Nick: No. I didn’t see it, and I think I even said that Friday. At some point, I said I think he might be one of those guys that’s just happy to be here. Yeah. I agree with you. He was there, and he took advantage of the opportunity with David Reese being out. Nick: As we say, reps are precious. You never want to see a guy lose out because of injury, but reps are precious, and they’re earned throughout practice and throughout games. Listen, if Rayshad Jackson had 20 snaps yesterday, he’s probably one of those that I think gets 25 based on the way he played. Andrew: I mean, Mullen said it. He said, the number of plays you get, snaps you get, are determined by the game before. Nothing tells me Rayshad Jackson didn’t earn more snaps when David Reese comes back. I’ll tell you something else too, Nick. Vosean Joseph played a lot more under control on Saturday night. Nick: That’s really the only thing that had really been the bugaboo with him. It affected him in both passing and running situations. It was just getting to a spot and not being able to set his feet. Just getting there at full speed, and then not being able to slow down and make the play. Just running through the play. Definitely looked better to me yesterday in terms of being more under control. I think that comes with maturity. Andrew: Yeah. I agree with that. Any final thoughts on defense, Nick, before we move on? Nick: Thoughts on defense. No. I think we’re good there. Yeah. Good on defense. Andrew: Okay. I wanted to go real quick to special teams. Won’t talk a ton about special teams, since we already talked a lot about it. Evan McPherson, leg strength’s there, my friend. Nick: Yeah. That was the thing where Mullen said leading up to it, and I asked him about it in the post-game, it might come down to right up to kickoff. I would like to see, I guess the way that they’re handling the new kickoff rule, being able to fair catch it inside the ten. Andrew: By the way, that’s the most stupidest rule I’ve ever seen. Nick: That’s dumb. I think maybe they were trying to get some air under some kicks, because I’ve seen be able to kick the ball deep into the end zone. Not through it like Eddy, but deep into the end zone. I think, how many did they return? They returned four kick returns. Maybe that’s something you could adjust and just kick it into the end zone. Andrew: Yeah. Because he showed he could kick it three-quarters of the way into the end zone. Nick: Other than that, two for two on his field goals. One for 21, one for 31. Nick: Jorge made one. His was from 39. I thought that McPherson, I don’t think, McPherson has a stronger leg. Andrew: Right. I think that was just a situation of get the backup kicker a chance. Nick: Yeah. That was with just under five minutes left in the third. So, I think McPherson looked very good. I don’t think there’s a kicking controversy. I think McPherson is your guy to go. That’s good to see from a freshman. You’ve got a kid here for four years now. Andrew: Right. Exactly. That was my thing. Didn’t see the punter. I mean, did see the punter. Excuse me. Didn’t see a ton from the punt game. Andrew: Well, didn’t see a ton, but that was the thing for me that stood out was just seeing that the kicking game was there. Both looked good, and the kickoff was there. Did have an atrocious kickoff one time of tackling. That was really bad staying in lanes. Again, Nick, the two blocked kicks, and there was pressure on the one punt when they tried to come after it. There was pressure there. Freddie Swain looked good at punt return. Looked like he had some confidence back there. Nick: Sure handed. I think that’s what came to my mind. Nick: I think it was Antonio Callaway, I think Callaway’s sophomore year, where you didn’t feel good when he was back catching punts, to make the right decision. I think last year you never felt comfortable when Florida was fielding punts. It seemed like when they should be fair catching it they weren’t, and they were letting the ball hit, and then you were getting a roll or getting a crazy bounce into somebody. I think Swain just made the right decisions, and that is something that sounds easy, but based on what we’ve seen the past couple years, maybe it isn’t that easy. Andrew: Remember Vernon Hargreaves. I mean, we all joked about that, but he was back there because he was the sure handed guy. Still made some plays there. It’ll be interesting to see if Freddie keeps it when Kadarius gets back. Maybe he does get some action back there. We’ll see. Overall, special teams a win. Win for me. Nick, we got to go to our players. I think we both did fairly well this week. Nick: You have them pulled up? I don’t have them pulled up. Andrew: I do. We both choked away a big one though when we said we thought that the running game would be the first one to score. That wasn’t the case, but one of my guys was the first one. Andrew: One of my guys was the first one to score though. Nick: Yeah. You got Trevon Grimes, and that play, obviously I watch a lot of SCA football, that play, that was Jake Allen and Trevon Grimes all junior and senior year, until Grimes got hurt. That was them. That little bubble screen there, and great block by RJ Raymond on that to really spring it. Andrew: Really good block. That’s something we didn’t talk about. The receivers had a really good day of blocking. Tyrie Cleveland, a big day. On that play, Nick, we didn’t talk about this. Not to get off subject, but to me, that was the biggest key for me with the receivers. Catch the ball, get up field. No dance, no this, no that. Catch the ball, get up field. That’s exactly what Trevon Grimes did. He caught the ball, took his speed, took it to the house. Six. Period. End of discussion. Agree, Trevon win for me? Andrew: Okay. Van Jefferson was your first pick. With the exception of a couple drops, good game. Nick: I think there were a couple good plays. I think he needs to squeeze. That back-shoulder pass in the end zone, that was a great pass by Feleipe. Great breakup by the defensive back, but your foot is in the painted area, you need to go ahead and squeeze that ball as hard as you can. There was some good defensive plays by Charleston Southern. Nick: Van Jefferson, four for 34 and two touchdowns. That’s a win. Andrew: Exactly. That’s 100% a win for you. You had Jordan Scarlett, and I had Lamical Perine. I’m going to be honest with you, Nick, I think we almost both have to take losses there, simply because they didn’t do a ton. I mean, Lamical two. Nick: We both take losses. Andrew: Yeah. Two for 28 and Jordan six for 24. Neither one did anything, but neither one of them were asked to do anything either. Andrew: Establish the passing game. Nick: Establish the passing game. Build some confidence. You probably could take advantage of this team. Nick: Yes. You’re not going to excite the fanbase by running for 400 yards. I mean, that would be cool, but you expect to be able to run. I think wanted and needed to see that from the passing game. Probably an oversight on our part to go ahead and expect Lamical and Jordan to carry the ball 15 times a piece. Andrew: Yeah. We talked over-under about the rushing being 200 yards or so, and we were both wrong on that. Again, I think that it was a well-established game plan. So, we both take losses there. You had Jachai Polite. That’s a win. I had Vosean Joseph. Nick, I’m sure the stats are not going to show a ton, but I feel like Vosean Joseph did a really good job in the game. Nick: Looking at Vosean’s stats. He had three tackles, two solos, and that’s it. I don’t know if that’s a win there, buddy. Andrew: Let me see what Mr. Polite did. Nick: I don’t know if that’s a win. Andrew: I’m trying to pull Jachai’s. Nick: Jachai had four tackles, two solo, a pass breakup, and a forced fumble. I don’t know what shenanigans you’re trying to pull here. Nick: I take a 2-1 lead in the player predictions. You can make your case on the message board, and people will let us know there on the message board. Does Andrew deserve a win for Vosean Joseph? Andrew: Probably not. I probably don’t deserve a win for Vosean, but I would like to take credit for a win, because I said I wanted to see a more patient Vosean, and I think I got what I wanted. Nick: We’ll put it to a vote. Andrew: I will say this, Nick, and that is that you and I both said we expected action on special teams, and we got that. Nick: Two blocked kicks and coming after that first punt. It had been a while since we’d even seen the team come after a punt. Andrew: Yeah. You do get a loss though for calling for a shutout. Nick: I was so close. I literally turned to Baileigh in the press box, and I was like, we’re planning out our stories during the game for after the game, and I was like, I think you’re going to need to write a story about the shutout. Here’s some stats about when the last time there was a shutout, and yada, and as that happens there was a big run that brought them down to the goal line. I’m like, jeez, nevermind. Don’t write that story. Andrew: There you go. That’s your problem. Let’s go here. I’m pulling this up to see the games we picked. Nick: Two of them as we’re recording still to be determined. Nick: So, we’ll go over those. Andrew: We can do a couple of them right now. Nick: FSU doesn’t play until Monday night. Andrew: West Virginia, we both got that one right. We both got the Auburn game wrong, unfortunately. Let’s see. We both got Alabama slaughtering them. You did lose Michigan. Nick: Yeah. Michigan. Good lord, they looked bad. Andrew: Our buddy, Barrett Soleis, had a good little stat. Jim Harbaugh and Butch Jones are both 8-8 in their last 16 games. Nick: Oh. Michigan is 9-9 in their last 18, 8-8 in their last 16. Jim Harbaugh is 1-6 against Michigan’s rivals. He’s not on the hot seat. Here’s one thing. Michigan has no money problem, but they would owe Harbaugh about $15 million if they got rid of him after this year. Andrew: Yeah. It just bad times. Nick: Not on the hot seat, but if they lose to Penn State and Michigan State and Ohio State again, that means Harbaugh has no wins against Penn State, maybe one win against Penn State. No wins against Ohio State. Michigan fans, he’s a Michigan man, played quarterback there. His bloodlines run deep there at Michigan, but it’s kind of like Butch and Derek at Tennessee. You keep losing to your rivals, and people aren’t going to accept that. Andrew: Exactly. There’s that. Couple recruiting notes real quick. Florida blew the visit out of the water for Trey Sanders. Had a really good visit with Nayquan Wright. Had a really, really good visit with offensive lineman William Harrod, the offensive lineman from up in Washington. Came out saying Florida was in good shape. Nayquan Wright said Florida is in good shape, and the decision is coming pretty soon. Florida did really well in the recruiting front. Great game for those guys to see. Nick, we’ll have this week. We got a Kentucky person lined up for us on Wednesday. We’ll be back on Friday to do our prediction podcast. Neither one of us will be predicting Kentucky to beat Florida. There’s that. Guys, also, breaking news. We don’t have to listen to that Kentucky sports radio moron again, because I’m sure he’s up there saying that Kentucky is going to win the National Championship this year. Nick: We will have Jenn Smith. She covers Kentucky football and women’s basketball for the Lexington Herald Leader. She will be on. We will have her on Wednesday, our normal Wednesday preview podcast. She does a great job for Kentucky, and we’ll see if she wants to make a prediction there as well. Andrew: There you go. Nick, tell everybody where they can find us. We’ll get out. We’ll see everybody on Wednesday. Make sure to check out Gator Country. We got a lot of good recruiting and football stuff coming at you. Nick: You got recruit reactions. Nayquan Wright, Trey Sanders. Your boy Diwun is infinity, his percentage committed to Florida is infinity. I like that. We’re not getting 87.6% committed. Andrew: I mean, he’s out there partying at tailgates and stuff. Nick: Yeah. Enjoy it. Anyway, find all the news. 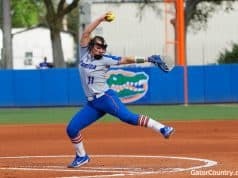 www.GatorCountry.com for all your Florida Gator news. The podcast is there in audio and transcript form. We got Google Play figured out for all you guys, so head to Gator Country when we tweet out the podcast link, and there is a download link for Google Play. You can subscribe there. Subscribe on iTunes. Search @GatorCountry and subscribe. Never miss an episode. Do your social media thing. @GatorCountry on Facebook and Twitter. @TheGatorCountry on Instagram. I’m @NickdelaTorreGC. He’s @AndrewSpiveyGC. Andrew: There you go. We appreciate it, guys. Good first week. Looking forward to the rest of the year. As always, go Braves and chomp, chomp. Nick: You stay classy, Gator Country.